Lenovo ThinkPad x130e comes with rugged design with stronger bezel and rubber bumper around the top cover which protects the edges of the system. 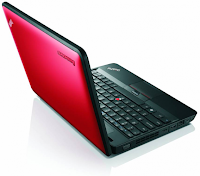 Featuring Lenovo Enhanced Experience 2.0 for Wimdows 7 which uses RapidBoot Technology, this computer can start about 20 seconds faster than a typical Windows 7 computer. ThinkPad x130e is powered by Intel Core i3-2367M, AMD Fusion E300, or AMD Fusion E450 processor and 11.6-inch HD LED display. The LED panel is protected by a strong bezel of 1.2 mm thicker plastic. This laptop is equipped with 320 or 500 GB HDD, gigabit ethernet LAN, wireless LAN, Bluetooth, Island-style keyboard, UltraNav with TrackPoint and MultiGesture ClickPad, HD audio, HDMI 1.4, VGA port, three USB 2.0 ports (one powered USB), microphone/speaker combo jack, Low light-sensitive webcam, and 3-cell or 6-cell battery.